In only nine seasons coaching at senior level, Warren McCarthy established a reputation as one of the most successful and brilliant coaches during the last days of the pre-Statewide era, guiding three clubs to six Grand Finals for three premierships. Known in football circles as ‘Putt’, McCarthy commenced his successful coaching career with Penguin in 1976, after a distinguished playing career with Cooee. Penguin hadn’t tasted premiership success since 1932, however under McCarthy they quickly became a force in coastal football and made their first Grand Final appearance in 44 years against Ulverstone, a game they would lose by 31 points. Determined to avenge the loss, McCarthy and Penguin entered 1977 as a group on a mission, and again reached the Grand Final, this time opposed to McCarthy’s old side Cooee, who went into the game as the hottest of favourites. Despite the odds, Penguin managed to produce one of the greatest upsets in NWFU history, toppling Cooee by just four points to spark wild celebrations. Penguin subsequently went on to annex the Northern Tasmanian premiership by defeating NTFA premiers Scottsdale, an achievement that established McCarthy’s reputation as a ‘supercoach’. McCarthy was a canny tactician, regularly conjuring highly-effective off-the-cuff positional moves. He was also not above using ‘sneaky’ tactics to help gain his side any advantage; this was particularly the case at Penguin, two of the most infamous examples coming during the 1977 Grand Final. McCarthy knew that his side’s best chance of victory was to kick with the wind in the first quarter, and therefore organised for the coin for the pre-match toss to be provided by a Penguin official. When the coin landed, both McCarthy and his opponent pointed to the scoring end; McCarthy later admitted that he knew he lost, quipping “I called heads – as far as I’m concerned a platypus has a head, so I won.” The umpire subsequently called for a re-toss, which McCarthy won “fair and square”, and Penguin received first use of the breeze. Late in the game, with Penguin in front but Cooee storming home, McCarthy deliberately headbutted the back of his opponent’s head in a marking contest, and used his bloody nose as ‘evidence’ of Cooee using dirty tactics to rev up his players for the final few minutes; the ploy worked, and Penguin held on for the win. McCarthy retired as a player at the end of 1978, also departing Penguin after three years to return to Cooee as coach. After one season in charge – resulting in a Grand Final loss to Wynyard – he spent a couple of seasons away from senior footy before returning in 1982. He subsequently led Cooee to three consecutive Grand Finals for two premierships in 1982 and 1984, the first resulting in McCarthy’s second Northern premiership. During this time McCarthy also took charge of the NWFU combined side, coaching it to a famous win over the TANFL in 1985, a catalyst for the formation of the TFL Statewide League the following season. The advent of Statewide football brought new opportunities for McCarthy himself, appointed as the inaugural coach of the Burnie Hawks – the new identity of Cooee – in 1987. 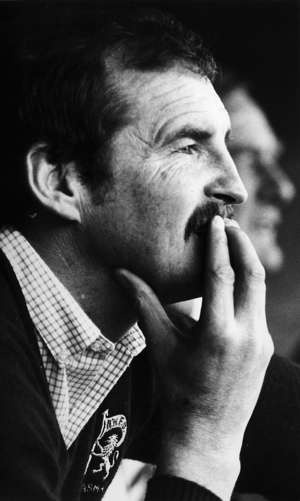 In two seasons at the helm, McCarthy guided the Hawks to successive finals series’, including a Preliminary Final in 1988. Unfortunately, the Hawks were smashed in that game by 110 points, and McCarthy departed as coach soon afterwards. McCarthy’s role with Burnie was his last in senior football. In 2003, his part in Penguin’s drought-breaking 1977 premiership was recognised by his being named coach of the club’s Team of the Century.